Large, distinguished Queen Anne-style house with a deep hipped roof and front and side-gabled wings, with boxed eaves with returns, two large corbelled chimneys, and weatherboard. The entrance has a transom and one sidelight, and windows are one-over-one sash. 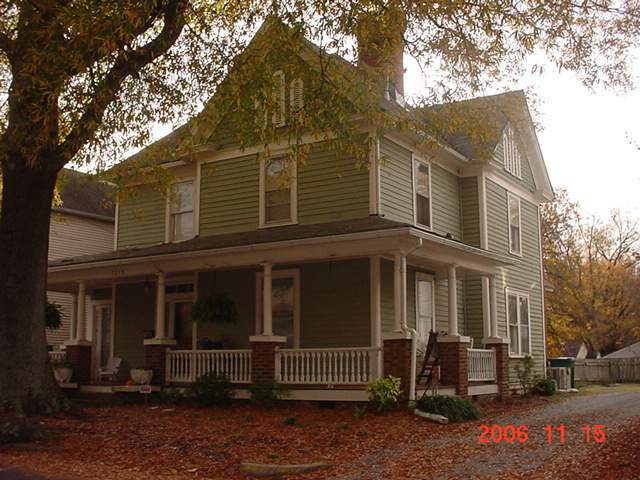 The wraparound porch has Craftsman brick piers, slender classical columns, and a turned railing. These may be replacements of the original Queen Anne porch finish. The gable end feature decorative wood shakes and triple arched louvered vents. Stephen Gates, an Orange County farmer, had this house built about 1913, but did not actually move here until about 1918. His farm occupied a sizeable amount of land, which was sold after Gates' death in 1936. Very similar to the house at 1113 Watts Street.